On March 6th (happy birthday Dad!) 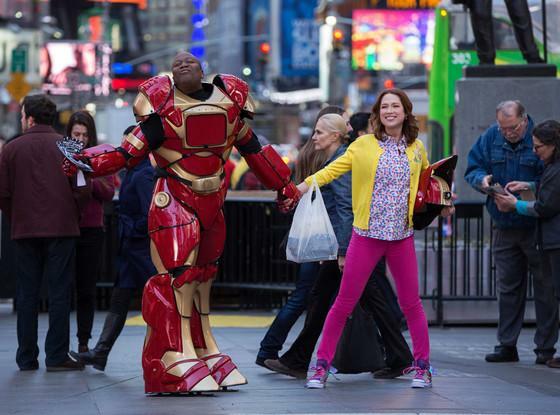 Netflix premiered it’s newest hit series Unbreakable Kimmy Schmidt from the hilariously talented and beautiful Tina Fey, starring Ellie Kemper whom the titular role was written for and is expertly crushing. I have so many thoughts on this show as I’ve already started binging on it for the second time. So there, you already know how I feel, minor obsession, but let me explain why. First of all, I’m a huge fan of 30 Rock. And I can honestly say that if you love that show, you’ll love this one. I’ve read a few reviews that contained the phrase “shared DNA” between the two shows because both series have so much in common. And sometimes this might come off as being a copycat or “more of the same” but alas, this is the Ocean’s 13 to 30 Rock. That analogy might actually be pretty accurate. NBC ordered this series, then decided to pass and sell it to Netflix. It’s first 13 episode season is now streaming on the service and I assume we’ll see season 2 early next March. I cannot wait. The show is about a teenage girl who had been tooken (original name for the show) and kept in a cult in a bunker for 15 years with 3 other women. Once Kimmy was released, she decided to live life to the fullest in NYC, and becomes roommates with and befriends Titus (played by Tituss Burgess), an aspiring Broadway celebrity. Or perhaps just aspiring to be any kind of celebrity. This is one of many 30 Rock alum that I’m glad to see is still working. Titus helps to update Kimmy on what she missed out on over the years while she supports him in his endeavors. Their landlord Lillian, is played by Carol Kane, a odd squirrelly character that comes off as normal once you’ve interacted with a lot of the other characters. Jane Krakowski returns as Jenna Jacqueline, a rich Manhattanite with the best backstory I’ve seen so far on television. Kimmy ultimately works for Jacqueline and at times there is a Jenna/Kenneth relationship that feels oh-so-right. I’m convinced Tina Fey makes at least two cameos, but the way my Netflix works, it goes to the next episode before the credits are finished rolling to confirm who is behind the robot (episode 7). But like I said, the Tina Fey DNA runs wild in this show, much like it does in 30 Rock. From the vibrant colors in the show that make it pop it look alive, to the music composed by Jeff Richmond, who is Fey’s husband. Also, the absurdity and almost cartoonish behavior exhibited by the characters and even the situations in general convinces me that Kimmy and 30 Rock exist in the same universe. Probably not, but I can dream. It also is meta on occasion, but played for laughs, of course. And Kimmy is very much it’s own thing, but as big a fan as I am of all things Fey, I can’t help but make connections. I do the same with JJ Abrams. There is another 30 Rock alum but I think it would be a spoiler if I said it. But you might be able to figure it out before the reveal near the end of the season. I can add Unbreakable Kimmy Schmidt to things I’m obsessed with. Ellie Kemper/Kimmy is what you get when you combine Tina Fey/Liz Lemon and Taylor Swift. I’m not a Swift fan but in this equation I mean that as a compliment. Quirky, cute and confident. Oh, and yellow looks great on Kimmy too. I’d be remiss if I didn’t mention the theme song. It WILL get stuck in your head at least once. So stop reading and start Kimmying already!